Mark is a highly dedicated and motivated musician, with a passion for sharing and developing music within the community. Having grown up in South London where he began studying the violin with Douglas and Helen Paterson, he went on to read music at the University of Exeter and it was whilst here that he was first given the opportunity to start conducting on a regular basis. After graduating, Mark studied conducting with Jonathan James from 2005 and from 2009 with Peter Stark (RCM). In 2014 he was given the opportunity to observe and assist Parvo Jaarvi and the Orchestre de Paris rehearsing Sibelius’ Symphonies 6 and 7 for performance and recording. His current conducting portfolio consists of Musical Director of Frome Symphony since 2009, conductor of the Brunel Sinfonia since 2011. 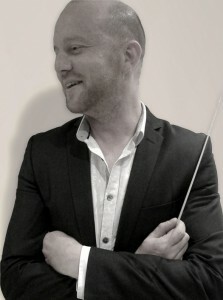 In 2014 he started working with Keynsham Orchestra. He has also had professional freelance experience with the Bath Philharmonia and the Bristol Classical Players. Mark has toured extensively around Europe conducting concerts in France, Belgium, Germany, Poland and Estonia. He feels very privileged to work with the great, exciting musicians he collaborates with on a regular basis – but also the opportunities to work with prestigious soloists such as the pianist, Stephen Hough. Working with young musicians is a core element to Mark’s professional life. He is currently Head of Strings at Bristol Cathedral Choir School where he teaches violin and viola, coaches a variety of chamber ensembles as well as conducting the String Orchestra. He is also the conductor for the Senior Superstrings Course, which is a fun, exciting string project based in Wiltshire. Mark is currently based in Bristol with his wife, Emily. He is a keen cyclist.